For one week, between August 30th & September 5th, many fancy Vegas restaurants offered special fixed-price menus with a portion of the proceeds donated to Three Square Food Bank. Depending on the restaurant, and whether you dined for breakfast, lunch or dinner, one could get a meal for $20.10, $30.10 or $50.10 Among the fanciest restaurants on the list was Alizé, a pricey French restaurant located in the Palms Hotel & Casino. At Alizé, a $50 3-course meal is considered a bargain. My husband and I hardly ever go out to eat, and by knowing we were contributing $10 to a local food bank and helping a hurting Vegas economy, we tried to justify our lavish night. This was my fourth time eating here. I’ve twice been with my parents to celebrate special occasions. Last time I dined here was in May 2008, when my 90-year-old neighbor treated me to dinner to thank me for driving him to several errands. The bill that night was over $600, and included each of us sampling some 90-year-old cognac that was $150 a pour! That meal was a once-in-a-lifetime experience, and definitely not something my husband and I could afford. 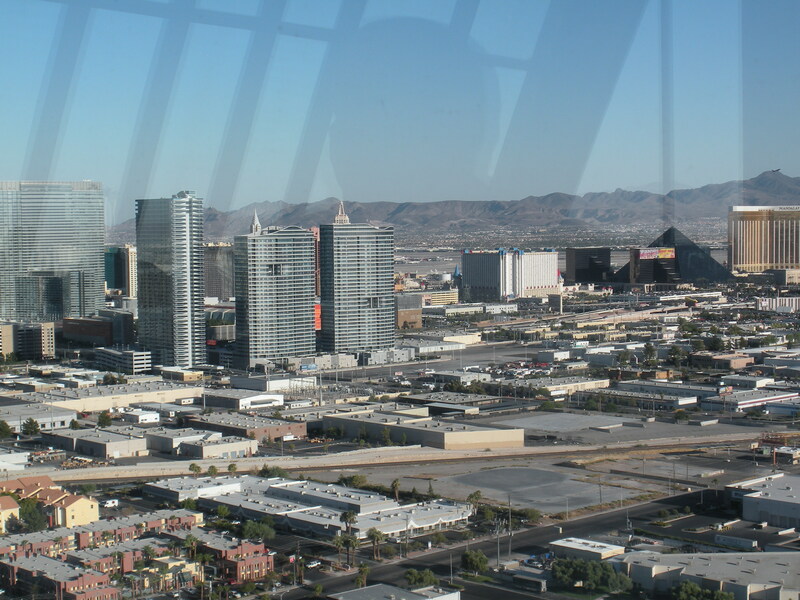 One of the perks of the restaurant is that it is located on the 56th Floor, so the location affords excellent views of the Las Vegas Strip. The ‘Vegas’ feel is even better later in the evening, when the neon lights of the Strip are turned on. However, due to the popularity of restaurant week, we were only able to secure a reservation at 5:30 pm. 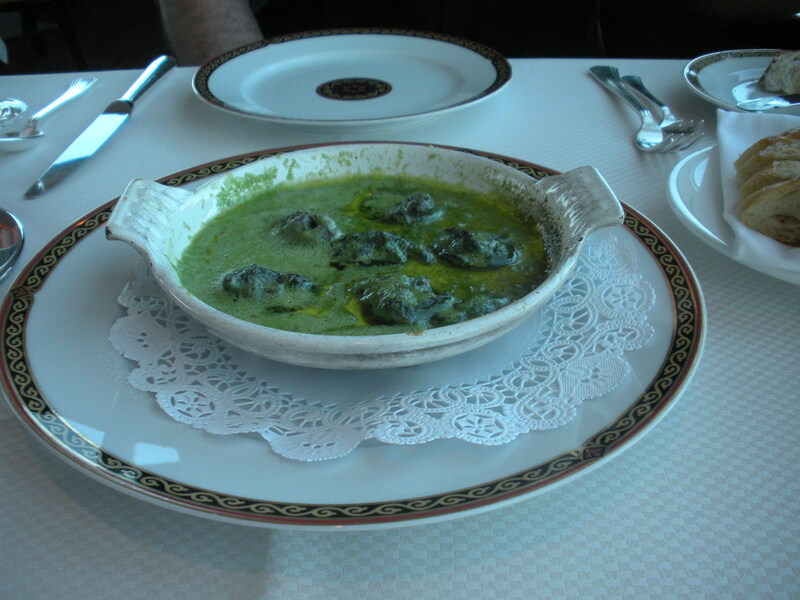 Although 3 courses was plenty of food, my husband and I chose to add a few extra items to our dinner – a bottle of Newton Cabernet Sauvignon and escargots in a garlic butter sauce as an appetizer. For my first course of the special restaurant week menu, I chose a field green salad served with caraway cracker and fresh goat cheese (goat cheese = one of my 10 favorite foods!). The presentation was priceless. For his starter, James chose the exceptional Maine lobster bisque. 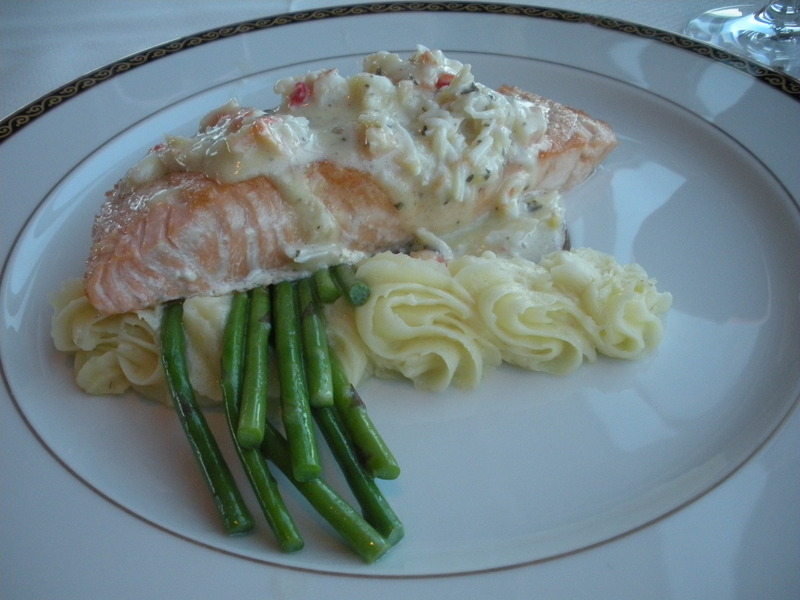 My entreé was a slow-roasted salmon served with a King Crab Bérnaise sauce. For accompaniments, it was served alongside some mighty tasty mashed potatoes with a hint of horseradish and pencil asparagus. 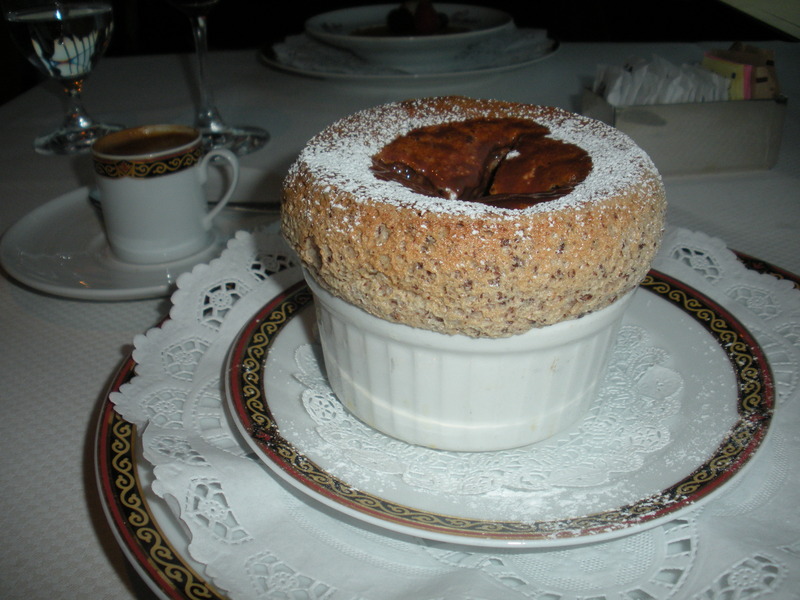 I wisely decided to take half my salmon home to save room for the grand dessert: chocolate chip soufflé. I added a single espresso to complement the meal. If you’re in Vegas and looking for a nice dinner, with exceptional atmosphere, food, and service, Alizé is a great choice. However, if you’re on a budget, be aware that the restaurant has a $45 per person minimum, reservations are a must and the restaurant observes a strict dress code. If you missed restaraunt week, but would still like to support Three Square Food Bank, the entire month of September has been designated “Hunger Action Month.” For a calendar of events, check out their link here. 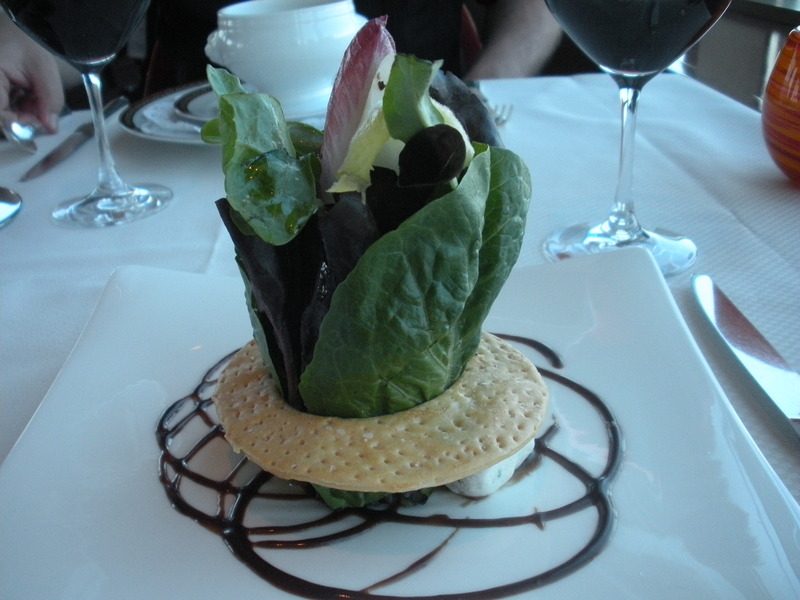 This entry was posted in Las Vegas and tagged fine dining, food bank, French cuisine, hunger, Las Vegas, restaurant reviews. Bookmark the permalink. I love goat cheese too! My all time favorite is sheep’s cheese, but I have a hard time find it in the US. Tonight I’m making goat cheese and spinach souffle from my Gordon Ramsay “Healthy Appetites” cookbook. Next time you are in Vegas, you should go to The Grape and opt for their cheese sampler plate. They have an excellent lavender-infused sheep’s cheese among other interesting concoctions.